Kryon Book 12 - The Twelve Layers of DNA Click on the image of the book to go to the KRYON Store. The Twelve Layers of DNA: In the last years, Kryon has identified all the layers of the interdimensional 12-layer DNA matrix. Kryon Book Twelve carries the entire discussion. In every case, these are recorded in various channellings which are now referenced on each layer's page (below). Many have asked for a summary of this study on-line, to enhance the book, so here it is! From Kryon Book 10: According to Kryon, the literal meaning of the Hebrew names is not essential for understanding the names of the DNA layers, and in some cases the Hebrew meanings are different. 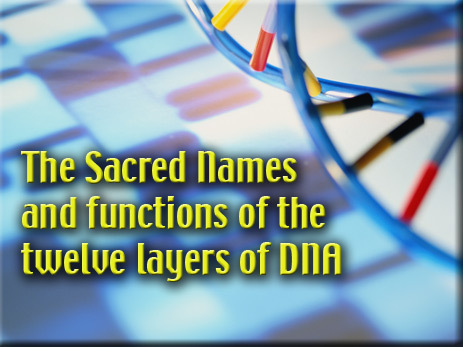 Kryon presents these Hebrew words as "sacred names" of the layers of the DNA, and explains their meaning in the context of sacredness. Kryon refers to the Hebrew language as being the... "current core spiritual language of the earth" and "each name is meant to be heard as a spoken phrase, strung together for the full meaning in Hebrew." According to Kryon, the meaning of the spoken Hebrew word lies in its energy, and therefore these Hebrew names should be spoken or heard as intended in Hebrew. Sound files are included in each layer below. Guided by this approach, the spelling chosen for the Hebrew names is as close as possible to the phonetic pronunciation of the Hebrew words, with the intent to maintain the energy that these words carry when spoken. There are several ways of rendering Hebrew vowels and consonants into Latin letters. As a result of Jews originating from all over the world, the individual's native tongue exerts considerable influence on the spelling and pronunciation of the Hebrew words. In the process of transliterating Hebrew words into the English alphabet, some form of compromise was required. We did not go into an academic discussion on the subject and kept the explanations regarding the pronunciation as simple as possible for the reader. The main guideline we followed was to reflect the pronunciation of these names in English rather then having them written "correctly" grammatically. For those of you who wish to expand your knowledge of the Hebrew language and its various pronunciation styles, you will find numerous books on the subject and various resources on the Internet. The following is a simple guide for the pronunciation of the Hebrew DNA names. Letters that are not listed are pronounced approximately the same as in English. Also included is the very basic information of the function of the layers, as Kryon gave them over four years. Kryon choose the Hebrew names in regards to their close resonance to the layer vibration/energy itself and not the literal meaning in Hebrew, although sometimes you can find similarity with that as well.The reason Kryon choose Hebrew names in the first place to represent the DNA layers, was mainly to honor the Core Energy of the Earth. Click the above to read the full story of how these layers were channelled, and the four year saga of what Kryon asked of Lee, and how Lee got the help he needed. Not everything is always as it seems, and Lee almost threw away the Hebrew altogether! Click the above to read what our Hebrew artist, and graphic designer has to say about the illustrations that accompany these channelled layers. By the way... a secret: The voice you hear pronouncing the Hebrew names on each layer page is that of Elan.